﻿ U-Fucoidan powder & capsules for distribuors and dealers in UK, ASIA & EUROPE. This is the genuine sought after UF-n now growing in popularity worldwide. Not to be confused with the cheaper regular fucoidan or regular brown seaweed extract. Harvested in the Kuril islands. Report on Fucoidan by the charity "Cancer Active." Delivered direct to us by the Russian harvesters and FOR ONWARD DELIVERY TO OUR DISTRIBUTORS, DEALERS AND MACKENZIE PROTOCOL CLUB MEMBERS. 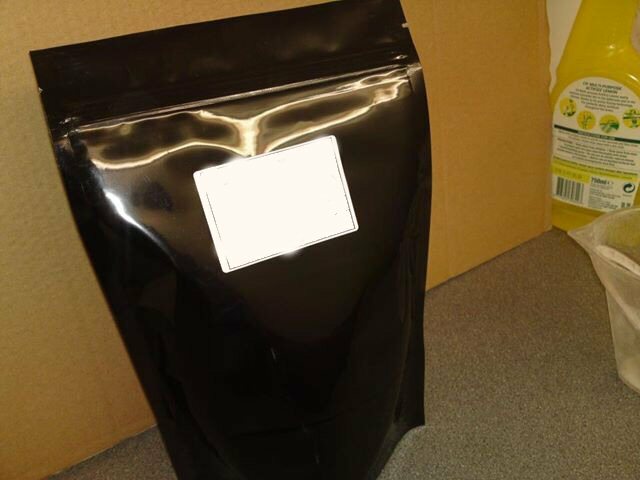 UF-n(UK) capsules encapsulated FROM THE GENUINE RAW POWDER by us in the UK . We specialise in just a few genuine up to the moment products proving to have beneficial properties from the latest research. Despatched from the UK. All EU/UK duties and customs procedures already handled and paid for by us. Buyers outside EU will be responsible for any import taxes due on arrival in their own country. Otherwise the price quoted here is what you pay including delivery worldwide. 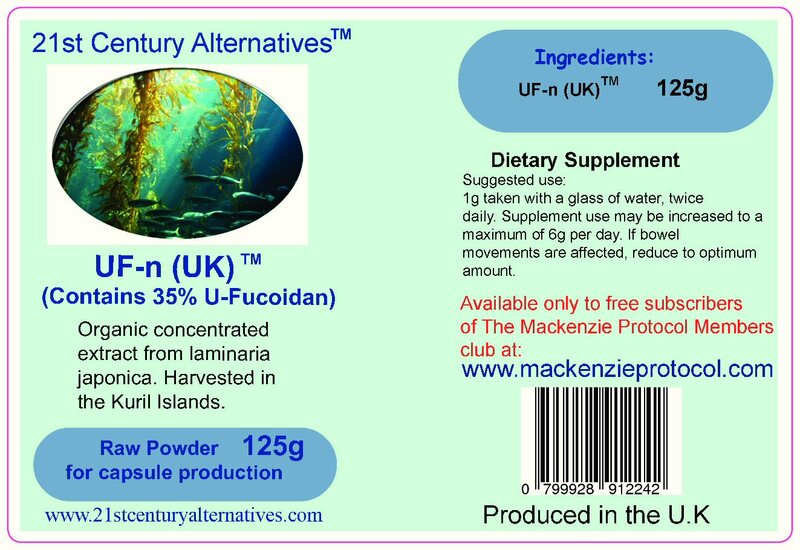 U-Fucoidan is the bio-available version of Fucoidan. UF-n is being extracted ONLY FROM THE CONCENTRATED SAP from Natural brown seaweed. Please Google "U-Fucoidan" for information. Not to be confused with cheaper standard seaweed or other Fucoidan extracts. U-Fucoidan is a genuine and highly researched natural plant extract. Just Google it! We manufacture and distribute only truly beneficial products and do not peddle cheap ineffective supplements. You also buy direct from us with no middlemen or MLM structure. Minimum order only 125 grams. Worldwide delivery included in the price. Attention UK and EU buyers:- If you are contemplating ordering Fucoidan from another supplier outside the EU you will be legally liable to pay additional charges for customs duty plus VAT. Our UK prices shown below include delivery, UK (EU) import duty already prepaid by us at 12.5% as well as UK VAT of 20%. larger wholesale orders = POA. UF-n CAPSULES. Bottles containg 60 capsules of 500mg of pure raw powder. No fillers! Do you want to order now? For samples or less than 12 units for non dealers please go to www.21stcenturyalternatives.com and select the online members shop link. Distributors and dealers are now being appointed to handle the amazing dietary supplement products of UF-n and Biofilam harvested and extracted from concentrated brown seaweed to a patented process in Russia. The patented raw ingredients are sent to the UK direct from the harvester/processors where capsules are produced and sent out from there. Anyone who hasn't yet heard about the amazing properties of these products can simply Google them and their scientific background because the UK company behind their distribution in the new regions are being cagey about making any claims for them due to draconian new laws by "Big Brother" that are creeping in worldwide under the nose of the public without their knowldege. Advantage Impex Co Uk Ltd is the company responsible for the new regional sales which is run by Tony Mackenzie at www.21stcenturyalternatives.com and he also runs The Mackenzie Protocol at www.mackenzieprotocol.com which is regularly introducing amazing new cutting edge science backed anti aging protocols. He states that this is the first time these products have been distributed outside of the USA. He further explains "We are conscious of the different controls by Big Brother which vary from country to country that prevent us from making any claims about these products despite the volumes of scientific reports that are available. If people want to try a natural product such as these they should be allowed to do so. Therefore, to be on the safe side, all our products are marketed only to researchers and buyers need to join our free co-researchers club before being allowed to purchase anything. This stipulation is passed on to all our distributors and dealers, The members don't need to be "sold" anything as consumers as they are informed researchers who already know what they want these products for." "Despite this restriction we operate an ethical and honest company and sales of all our products are now growing exponentially. These latest additional products which are already selling well outside the UK are no exception and we look forward to welcoming new clients, distributors and dealers worldwide." Are you interested in knowing about the new worldwide controls over natural products? "If people let the government decide what foods they eat and what medicines they take, their bodies will soon be in as sorry a state as are the souls who live under tyrrany." - Thomas Jefferson. Learn about the outrageous new laws being brought in globally without the general public awareness. Featuring Dr. Robert Verkerk (Science Director of the Alliance for Natural Health)'. © Website owned by Advantage Impex Co UK Ltd. All Rights Reserved.